Much has been experimented with, written and discussed concerning the treatment of bamboo in rod making over the years. On this page I will explain what I do in regard to the various methods and treatments I use to make a rod. When I receive my bamboo, I check split the culms to eliminate any unwanted wild splits. Often times the culms are slightly green yet, so I prop the culms up on my back fence out in the sun to bleach them out. I turn them every day so that the sun can hit all sides, so no areas will retain any of this green shading, and all the while the bamboo continues to age, or dry out. This bleaching takes about a month. Then I cut them in the half, (depending on nodal arrangement). I then temper all the culms in a modern bakery oven that is completely and evenly temperature controlled. I learned that when I worked in a bakery as a youngster that certain areas in the oven that I worked with were cooler than others and that I had to let the bread bake longer in those areas to bake the bread properly. It was a very old and outdated oven. The oven that I have access to today, has no "cold spots". I get very even tempering of my culms without the "timed rolling and reversing" that most rod makers have to contend with. 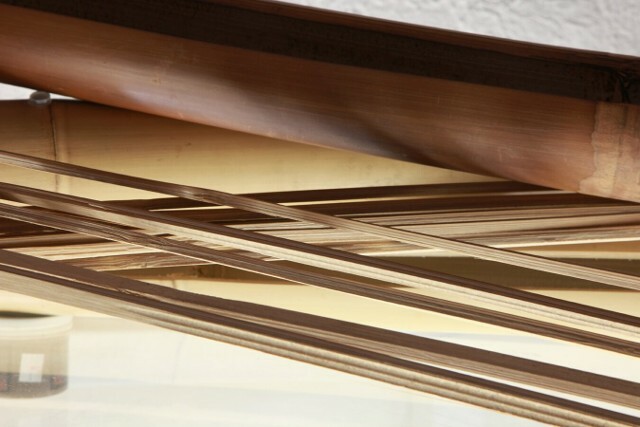 I have the added luxury of knowing that if I screw up a strip or find a flaw during the planing process, I know that I can get a replacement strip from its original culm, and know that it is of equal temper. It is also a time saver in that I can temper twenty culms to the batch. I then sand the nodes flush with the enamel on either side of the nodes, and then flame them to a color that I can only describe as a Payne caramel color. Upon request I can either darken them or limit the flaming so as to make them a lighter color as well. This flaming imparts a bit more strength to the bamboo than just the oven tempering process and produces rods that have the steely character that I like. To keep the rods from being a bit too "steely" for their intended taper, a bit of innovation is employed to keep that from occurring, but that isn't for the ears of all. Then the bamboo is split, the inner nodal dams sanded off, the nodes are mismatched and measured for the intended length of the rod being built, the nodes are sanded smooth, then the nodes are pressed while retaining the natural radius of the culm, then the strips are straightened.The strips are rough milled to 60 degrees, rough tapered to within .050 thousandths of being finished, and then planed out on a Morgan Hand Mill to finish specs. The sections are glued up, bound and allowed to cure. The string is then removed and then the sections are carefully sanded, and only down to the top of the power fibers, and then polished with 2500 grit sandpaper. I then hang the sections in a "chimney" of sorts with a heat source (135 degrees) for three days. I then remove them and while warm, wipe them with a solution that will soak in to the outer layer of power fibers roughly .005 thousandths. This solution when cured (about a week), will inhibit moisture from reentering the bamboo, and effectively limit the possibility of the sections from taking sets. Then the ferrule stations are cut, ferrules mounted, and finally the rod blank will wait for your final direction as to how it is to be finished.